A TANGLED SKEIN The sun's knotted magnetic fields, visualized here as white lines, scramble cosmic rays and may cause them to shoot energetic light called high-energy gamma rays toward Earth. The sleepy sun turns out to be a factory of extremely energetic light. Scientists have discovered that the sun puts out more of this light, called high-energy gamma rays, overall than predicted. But what's really weird is that the rays with the highest energies appear when the star is supposed to be at its most sluggish, researchers report in an upcoming study in Physical Review Letters. The research is the first to examine these gamma rays over most of the solar cycle, a roughly 11-year period of waxing and waning solar activity. That newfound oddity is probably connected to the activity of the sun’s magnetic fields, the researchers say, and could lead to new insights about the mysterious environment. "The almost certain thing that's going on here is the magnetic fields are much more powerful, much more variable, and much more weirdly shaped than we expect," says astrophysicist John Beacom of the Ohio State University in Columbus. The sun's high-energy gamma rays aren't produced directly by the star. Instead, the light is triggered by cosmic rays - protons that zip through space with some of the highest energies known in nature - that smack into solar protons and produce high-energy gamma rays in the process (SN: 10/14/27, p. 7). All of those gamma rays would get lost inside the sun, if not for magnetic fields. Magnetic fields are known to take charged particles like cosmic rays and spin them around like a house in a tornado. 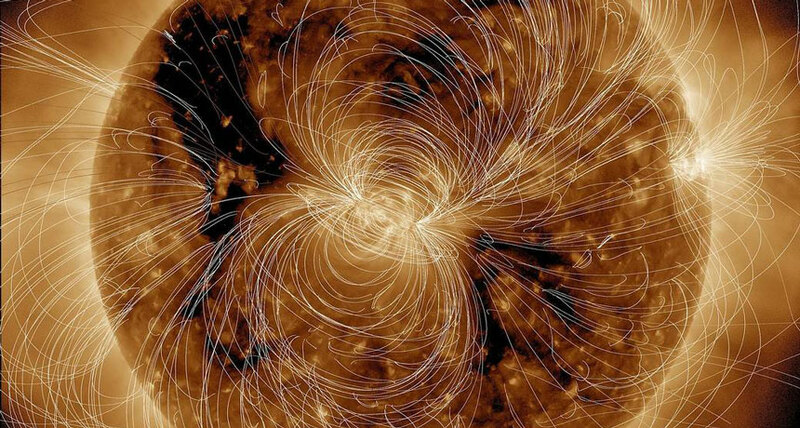 Theorists have predicted that cosmic rays whose paths have been scrambled by the tangled mass of magnetic fields at the solar surface should send high-energy gamma rays shooting back out of the sun, where astronomers can see them. Beacom and colleagues, led by astrophysicist Tim Linden of Ohio State, sifted through data from NASA's Fermi Gamma-ray Space Telescope from August 2008 to November 2017. The observations spanned a period of low solar activity in 2008 and 2009, a period of higher activity in 2013 and a decline in activity to the minimum of the next cycle, which started in 2018 (SN: 11/2/13, p. 22). The team tracked the number of solar gamma rays emitted per second, as well as their energies and where on the sun they came from. There were more high-energy gamma rays, above 50 billion electron volts, or GeV, than anyone predicted, the team reports. Weirder still, rays with energies above 100 GeV appeared only during the solar minimum, when the sun's activity level was low. One photon emitted during the solar minimum had an energy as high as 467.7 GeV. Strangest of all, the sun seems to emit gamma rays from different parts of its surface at different times in its cycle. Because cosmic rays that hit the sun come in from all directions, you would expect the entire sun to light up in gamma rays uniformly. But Beacom's team found that during the solar minimum, gamma rays came mainly from near the equator, and during the solar maximum, when the sun's activity level was high, they clustered near the poles. "All of these things are way more weird than anyone had predicted," Beacom says. "And that means the magnetic fields must be way more weird than anyone had thought."